But many Saturn retailers aren't in as much of a rush to sell all of their inventory just yet. "We're in a holding pattern," Motor City Auto Center General Manager John Pitre said in an interview with AN. "It'll probably take six months to locate and secure another franchise for that facility, so we want to keep it up and running for that amount of time." Today GM began an incentive program that runs through the end of the month. Consumers can get either $4,000 off of any 2008 or 2009 Saturn or 0% financing for 72 months. In addition, a loyalty mailing to current Saturn owners offers an additional $1,000 in cash. That's regardless of whether they trade in their Saturn vehicle. Sources tell SaturnFans.com that in some cases, additional regional incentives may also be applied. Check with your local retailer for more information about what might be offered in your area. 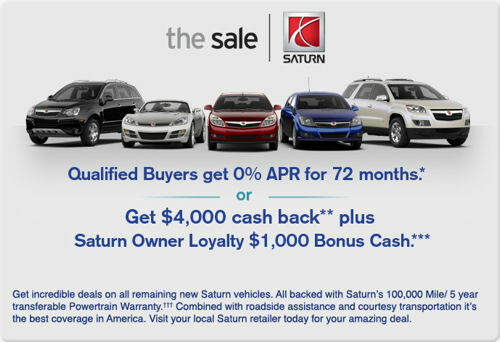 GM spokesman John McDonald told AN that owners "have to have owned or leased their Saturn vehicle for a minimum of six months to qualify" for the loyalty incentive. Saturn general manager Jill Lajdziak told reporters in Frankfurt at the 2007 International Motor Show that progress was moving along "very quickly," and the brand will introduce a plug-in version of its Saturn Vue Green Line hybrid "in 2009-ish." Lajdziak was in Germany to unveil the production version of the 2008 Saturn Astra hatchback. There are currently 6 users and 335 guests online.